A quick view of the most influential metrics in Mira Mesa. The community of Mira Mesa is a neighborhood in the larger city of San Diego, California. It spans from Interstate 15 to Camino Santa Fe and from the Marine Corps Air Station at Miramar up to Los Penasquitos Canyon, which is approximately 16.406 square miles. According to the 2010 census the neighborhood was home to 72,759 residents and had a population density of 4,435 people per square mile. Mira Mesa was built as one of San Diego's first suburbs and today it is the largest and perhaps the most diverse community in all of the city. The area has a rich military history, in the 1930s and 40s Mira Mesa was used as a United States Army test area . And, just across what is now Interstate 15 there was Hourglass Field, an auxiliary Naval Landing Field. After the war, the baby boom led to a housing boom in 1969, which was the beginning of Mira Mesa as a community. Houses sprang up so quickly that the area lacked retail establishments, schools and medical services this led to more community planning as the city of San Diego grew. Steps were taken to establish schools and retail establishments and all the other things that a thriving community needs. Today the neighborhood his home to many stores, restaurants and drinking establishments, as well as industrial centers, offices, and tech companies like Hologic and Qualcomm. Mira Mesa features quiet streets, beautiful parks and comfortable suburban sprawl. The community is a lively one with annual evens like the Mira Mesa Street Fair, and the Fourth of July Extravaganza. The community features the San Diego Ice Arena, fields for a variety of sports from soccer and football to softball and rugby. There are also three major community parks as well as neighborhood parks and the Ned Baumer Aquatic Center at Miramar College, which is open to the public. The community is also a craft brewery hub and is home to Ale Smith Brewing Co., Wet 'N Reckless Brewing, Callahan's Pub & Brewery and others. Mira Mesa features quiet streets, beautiful parks and comfortable suburban sprawl. Homes for sale in the community are predominantly middle class structures and range from starter homes up through large family homes. Rental options include apartments and duplexes. On rare occasions one can find town homes and condominiums available with in the community. Local real estate agents await to assist you in finding the perfect home for you and yours in the bustling community of Mira Mesa. View our selection of available properties in the Mira Mesa area. 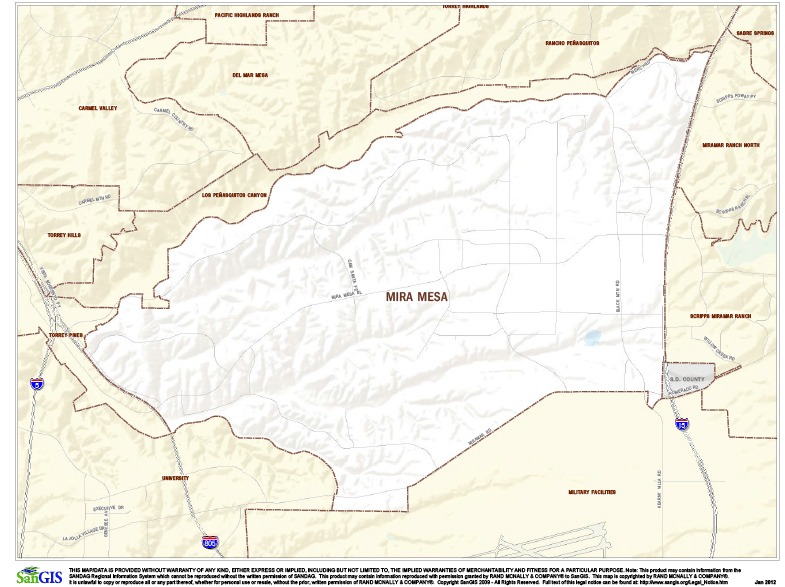 Check out the latest demographic information available for Mira Mesa. Learn more about schools near Mira Mesa complete with ratings and contact information. Browse through the top rated businesses in the most popular categories Mira Mesa has to offer.